COMMITTEE GIVEN CERTIFICATES—These are the members of Welcome Lane committee honored at Pier 39 Friday by Greater Seattle, Inc., for their two-year support of Seattle's tradition of a gala homecoming for troops arriving from the Orient. They hold certificates of appreciation presented by Greater Seattle. Shown (from left) are Frank Sugia, Jack Gordon, Gene Boscacci, Mary Williams, Naomi Foote, Mrs. Rosetta Gibbon. 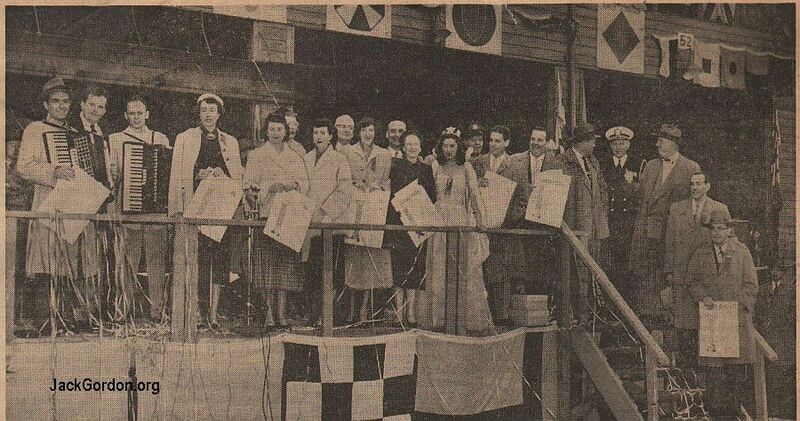 Kay Stevens, L. A. Williams, Mrs. Gudron Baker, Julius Rosso, Mrs. Florence Barclay, Seafair Queen Iris Adams. Maj. Bill Haroldson, Jerry Morris, Jerry Ross, Joe Wasser, Capt. Joseph Chapman, George Huserick, George Barclay and Harry Reed. It was the second anniversary Friday of Greater Seattle's organized welcome to returning troops from Korea. And the old town outdid itself for the 2,589 American and Canadian returnees aboard the USNS Gen. R. L. Howze—the 176th ship to arrive since the rotation program began on May 5, 1951. Because no other civic group in Seattle thought to give the people of the volunteer welcoming committee a birthday party, the committee had to stage its own and sing "Happy Birthday" to itself. But it was a good show, everyone was thanked, and the Americans and Canadians back from Korea had a bee-youtiful welcome. Ready for the committee when the big transport came alongside the Seattle Port of Embarkation wharf was a huge birthday cake that had been cooked aboard. It was taken to Welcome Lane on 2d Ave, sliced by the ship's baker and served to them as wanted it. Plenty wanted it and it was gone in a moment. GETS NEW NAME — Lt. Col. Edward M. D. Leslie of Canada is pictured after arrival from Ko­rea aboard troopship Saturday. The son of Gen, A. G. L. Mc-Naughton, he changed his name while in Korea in compliance with will of aunt who left him $250,000 if he would take her family name. Welcome Lane was boisterously noisy Friday morning when the troop-carrying buses rolled through on their way to Fort Lawton. Confetti and paper snips fell from tall buildings along the way like a blizzard. The Barclay girls came up town to do their can­can routine, and it gave the place a wicked look. An Air Force band preceded the caravan on foot up 2d Ave., thousands of spectators pressed into the street from the sidewalks, and the faces framed in the bus windows were uniformly radiant with surprise and pure old fash­ioned joy. One of the first off the transport was Lt. Col. Edward M. D. Leslie of the 1st Regiment of the Royal Canadian Horse Artillery. He stood by the gangplank, as is the custom, while his troops disembarked. The Colonel is an interesting man for a number of reasons, not the least among them because he recently changed his name to Leslie from McNaughton. He is the son of Canadian Gen. A. G. L. McNaughton who during World War II was for a time in charge of all Canadian troops in Europe, and who is now chairman of the International Joint Commission. The Colonel changed his name because his aunt, Mrs. G. St. John Leslie, who was childless during her lifetime, bequeathed him $250,000 if he would take the name of Leslie. The Colonel is a mild-mannered, normally reticent person with a slow smile, and he quite obviously preferred not to talk about his new name, which he acquired while he Korea, but he did talk some. He said it was hard to get used to the name Leslie at first but he feels like the same person he was when they called him McNaughton. "Wasn't there an enormous amount of red tape in the army when you changed your name?" he was asked. "Oh, I think not," he said. "My solicitors at home took care of all of that you know. As a matter of fact, I believe I signed only one paper." The brigadier came along at that moment, and the colonel came smartly to salute with a loud click of heels and an arm stiff as iron. The brigadier, a moment before, had startled everyone by addressing Canadians aboard the ship not only in English but also in what sounded like very fluent French. 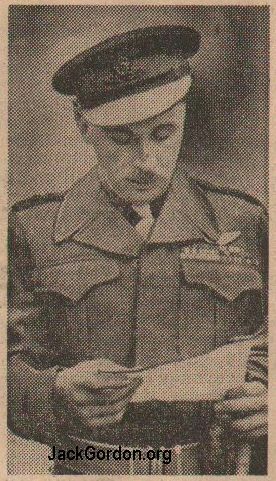 The brigadier was W. J. Megill, commanding officer of the B. C. area for the Canadian army. He looked very smart and official and he seemed quite pleased at the tumultous welcome his peo­ple were getting at the wharf. The mayor of Seattle made a good speech and a short one. He said something per­haps that has needed saying for some time. He said "Seattle is proud to represent ALL THE OTHER CITIES OF AMERICA in welcoming you home. We are saying the things that your own towns would say if they had our opportunity." That made the Seattle welcome look a little less self-serving. Alfred Rochester, city councilman; Mrs. Gudron Baker, Seattle Trust and Savings Bank; Miss Iris Adams, 1952 Seafair queen; Maj. Bill Haroldson, 567th Air Force Band, McChord Air Force Base; Capt. Joseph Chapman, chief of staff, 13th Naval District; Mrs. Rosetta Gibbon, composer of the "Welcome Home" song; George Huserick, Wholesale Florist Co.
Josepn Wasser, motor officer, Fort Lawton; George and Florence Barclay, Barclay Dance Studios; Chet Gib­son, Gibson Sound Co.; Chief of Police James Lawrence; Harry Reed, president of the Musicians Association of Seattle; L. A. (Bill) Williams, Puget Sound Power and Light Co.; Chet Ramage, Gene Boscacci, Freeman (Red) Inglesby, Frank Sugia and Jackie Souders, local orchestra leaders. Jerry Morris, Washington Jockey Club; Jerry Ross, theatrical agent; E. E. Lewarch, traffic engineer's of­fice, Seattle; Fire Chief William Fitzgerald, David L. Jones, florist; Julius Rosso, Seattle Flower Growers, Inc.; Mary Williams, chairman, Bank Women of Seattle; Guy Williams, Williams and Gordon; Jack Gordon, committee chairman; Paul Thorsen, Beall Greenhouse Co.; Naomi Foote and Kay Stevens, vocalists.